These 100% natural aromatherapy and herbal heat products are hand-crafted to provide you with comfort and quality. 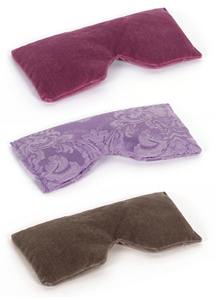 The herbal eye packs are both beautiful and soothing for tired eyes. Enjoy the comfort of specific targeted blends with true aromatherapy benefits that are increased when heated in the microwave. Contains a blend of rejuvenating herbs that include lavender, chamomile, passion flower, peppermint and vanilla in a pack the perfect size and weight to bring relief to tired eyes. Makes an excellent gift!